Probably one of the oldest attires ever invented in India, Saree is the traditional outfit of most Indian women, beautiful, enchanting and comfortable at the same time. An unstitched length of fabric, usually six to nine yards long is draped around the body to gracefully decorate the female form. Worn with traditional or modern jewellery, and matched with a lovely blouse, the beauty and grace of a saree is second to no other Indian outfit. Thanks to the advent of fashion, the saree has undergone several changes over the years, in the manner in which it is draped around the body. Those new to this Indian garb would probably be amazed to know that this six yards length of fabric can be worn in a zillion ways, with each community and region in India having their own style of draping it. In the western state of Maharashtra for example, the traditional saree form is called navvari which literally translates to nine yards. This form of saree looks like a mana? ?s dhotifrom behind and looks extremely beautiful worn with traditional gold or pearl jewellery, especially the nose pin. In Gujarat the is worn with pleats in the front facing the right. estrace reviews Pleats are made by gathering a portion of the saree and folding it symmetrically into small sections. It is worn with apetticoat which is a waist-to-floor garment, tied tightly at the waist by a drawstring. The pallu which a section of the is worn over the right shoulder in Gujarat and Rajasthan, unlike in many other states where it is draped over the left shoulder. In Bengal the saree is draped around the body without any pleats, due to the influence of strong traditions and a simple lifestyle. Towards south, in Coorg, the Saree is pleated at the back and forms a fan at the rear, witha small section of the Pallu tucked in. 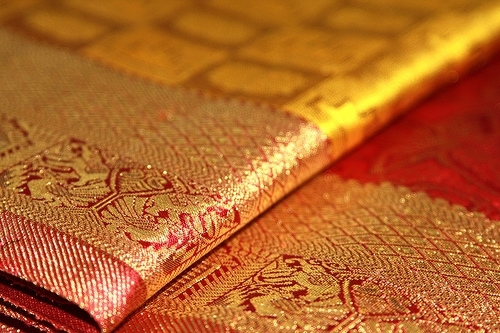 Irrespective of the style of draping it, the Pyridium price list saree is one of the most beautiful and elegant outfits which is now also doing the rounds of international ramps.